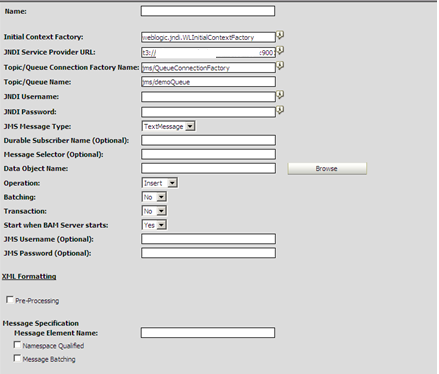 In this Post I will explain you step by step process to configure EMS in BAM. Step 1: First we need to have JMS queue. So let’s create a JMS queue first. Step 2: Now create a new connection Factory. Enter following values for Connection Factory. Step 3: Now we will configure EMS in BAM, but before that we need to have Data Object in Bam, so let’s first create Data Object. Go through my Previous Post that explains how to create Data Object in BAM. 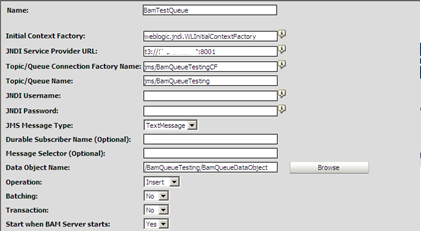 We created “BamQueueDataObject” in BAM having below fields. Step 4: Now Configure EMS. Choose “Enterprise Message Source” from drop down list and click on create button. Now we need to fill following details. 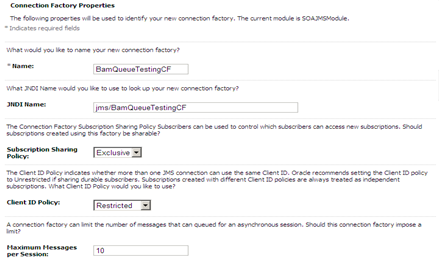 Since we created the JMS queue which is targeted to SOA server, so here soa server port will come. o Data Object Name – Click on Browse and choose the DO which we created earlier. Now we will map message in the Queue to Data Object. We will get following message in JMS Queue. 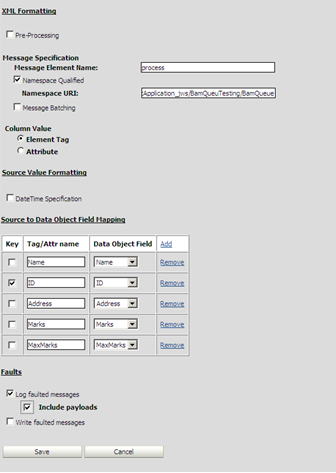 o Check “Element Tag” as we need to map need Elements in Message in JMS queue to fields in Data Object. Step 4: Now we are ready for testing. Start the EMS that we created just now and put one message in Queue. You can see same data in Data Object. o Start mapping Data Object fields. o Check “Log faulted Message” in case you need to log the message if any error occurs. Go Through my previous post which explain how to create Data Object In BAM. Vivek, How to use JMS Topic in BAM? In your post I think we are using JMS Queue.